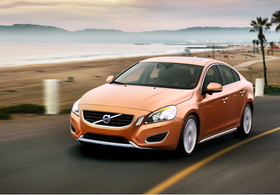 The new Volvo S60 marks the launch of the automaker's pedestrian-detection technology. The redesigned Volvo S60 sedan gets a formal debut in Geneva early next month, but Volvo has already unveiled details for what is says is one of its sportiest cars ever. Buyers in the United States can choose between two chassis setups -- a softer, comfort chassis or a sportier dynamic chassis. The dynamic chassis is standard in Europe. The dynamic chassis gets stiffer shocks and upgrades to the front and rear subframes. On the technology side, Volvo is equipping the S60 with its pedestrian-detection technology. The system can sense when a pedestrian who is at least 80cm (about 2 feet 6 inches) tall steps in front of the car, and at speeds up to about 35kph (about 22 mph), it can automatically brake the car to a stop before hitting the pedestrian. At speeds greater than 35kph, the system applies the brakes to slow the car before it hits the pedestrian, possibly reducing the severity of injuries. The new S60 also has Volvo's City Safe technology, which automatically applies the brakes when the car senses that a crash is imminent. The system can help prevent crashes at speeds up to 29kph (18 mph). Other technology includes dynamic stability control, all-wheel drive and a corner traction control that brakes the inside wheel on a turn while directing more torque to the outside wheel to reduce understeer. The top engine under the hood is a turbocharged inline six-cylinder engine rated at 304 hp, mated to a six-speed automatic. A 2.0-liter turbo four is also on the powertrain list, rated at 203 hp and mated to either the six-speed automatic or a six-speed manual. Volvo says it plans to sell about 90,000 units of the new S60 a year globally, with about 30,000 sales in North America.